The FBI agents investigating President Donald Trump for fear that he could be compromised by foreign agents were, themselves, guilty of the same thing. The two agents famous for being the undercover lovers of the agency, Peter Strzok and Lisa Page, were able to be compromised, a top FBI official said, The Daily Mail reported. ‘In my opinion, yes,’ he responded. 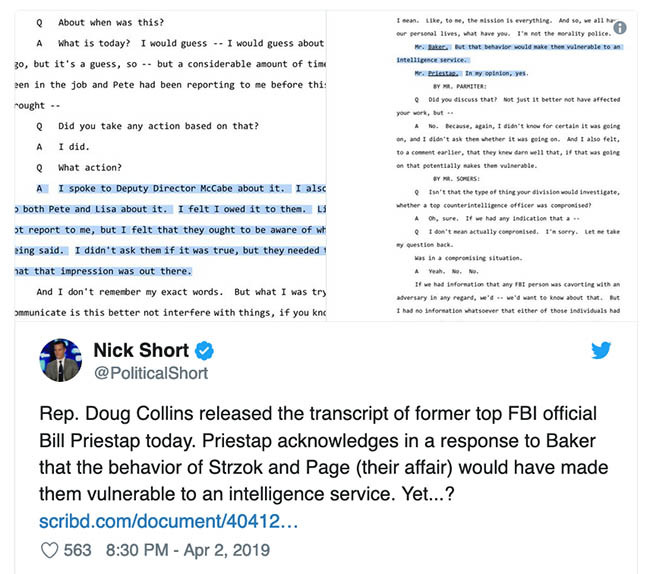 The Fox News Channel reported Wednesday on Priestap’s view of the implications of the Strzok-Page liaison. House Judiciary Committee member Doug Collins, a Georgia Republican, released a transcript of his testimony on Tuesday. The senior FBI official testified June 5, 2018 in a closed session held jointly between the House Judiciary and Oversight committees. Republicans controlled the House at the time.